15-2150MHz Wideband 2-Way Satellite TV Signal Splitter With all Ports Power passiing. 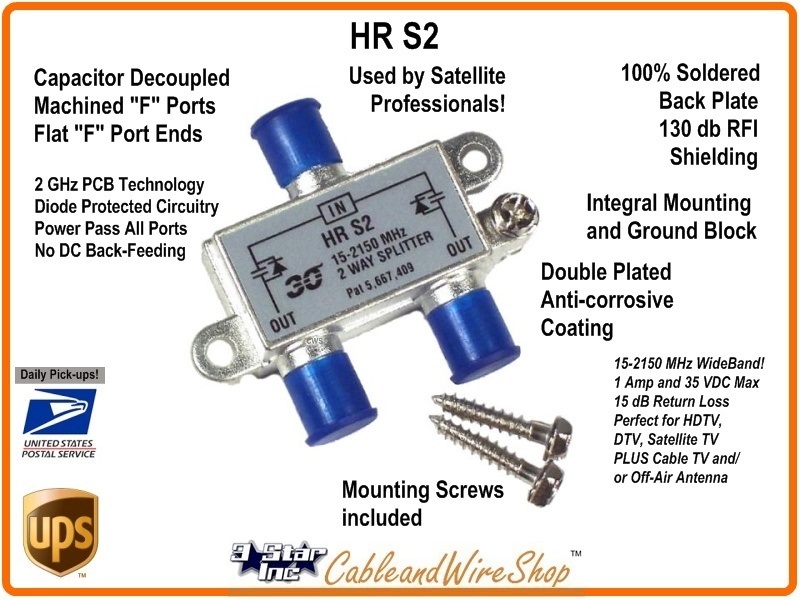 Features Horizontal F Ports, Grounding Block Attached, and Solder Back Case for 130 dB RF shielding. HOLLAND Electronics' high performance passives are designed for distribution of digital satellite signals in applications where signal integrity is critical. The HRS Series Splitter utilize diode protected circuitry to prevent DC backfeeding. Note: When Splitting the High Frequencies of Satellite TV Services to feed multiple Receivers, the Loss associat3ed with the Splitter May need to be compensated for with the use of an Inline Satellite TV Drop Amplifier (Signal Booster) specific to this purpose and Frequency Range. Consider the need and review the "Satellite TV Amplifier" category for selection. Most of these Satellite Inline Amplifiers are line powered from the Satellite Receiver and will not, under most circumstances, require any externally coupled supply that this is intended to couple. If the receiver doesn't inject DC power for use by LNB(F)'s, or the segment of cable you need to amplify doesn't have DC Voltage on the line at that point, and you need to install an Inline Amplifier there, this is the means to get power on that line! This Power Inserter will pass Frequencies also associat3ed with Cable TV and TV Antenna use. TV Antenna Pre-Amps usually include a Power Supply and Inserter, if you need an Inserter for this purpose, this one will do. Most Inline Cable TV amplifiers also come with the aforementioned accessories, but if you are missing them, this Inserter will also fit the Bill. Commensurate with Coaxial Cable TV Antenna and Satellite TV Power Inserter Installation, you want to Ground your Cable TV or HDTV Antenna Coaxial Cable System Outside before bringing the TV Cable Inside. This way, Lightning Strikes and Power Surges have an opportunity to arrest before reaching your Satellite Receiver and TV Set(s). The Integral Grounding Block designed onto most Outdoor Use Compatible Satellite Signal Splitter and Inserters we sell will effectively convey this unwanted Electrical Energy to a Ground Rod via a Copper Ground Wire that you Install (not included). Consult your Local Building Code and NEC for guidance to Properly Grounding your HD TV Antenna, Satellite TV, Cable TV, WI-FI, Wireless Internet, Business Band, CB or Amateur Radio Antenna Installation. Great people to buy from! Great people to buy from, very fast shipping!